EMP is a leading producer of mechanical and electric water and oil pumps, electric fans, thermal management systems, and highly complex precision machined components for the on-highway, off-highway, specialty and hybrid, transit, power generation, marine, and military markets. Together, Valley and EMP are focused on delivering value-added products and engineered solutions to our customers utilizing thermal and oil management technologies. Mini-Hybrid Thermal Kit. 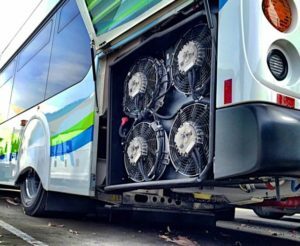 Designed to eliminate engine overheating, particularly in the harsh start-stop conditions experienced by the mass transit buses, the Mini-Hybrid is ideal for retrofitting/refurbishing existing transit fleets. Benefits include better fuel economy, lower maintenance costs, improved safety ty elimination of hydraulic leaks or fires, and improved emissions. Electric Water Pump, WP29/32. Providing commercial grade high performance, EMP’s electric water pump has a long life brushless motor designed for applications such as hydraulic cooling, EGR cooling, jacket water cooling, CAC cooling, electronics cooling, and secondary cooling for the transit, school bus, and construction markets. TK 2 Cooling Kit. 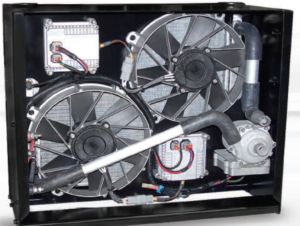 Simply the best cooling system on the market for commercial and hybrid vehicles, the TK 2 Cooling Kit is perfect for both on-highway and off-highway applications by reducing the maximum coolant temperature and eliminating engine power cut-back, thereby extending engine life. OK1 and OK2 Hydraulic Oil Cooler. A high performance air to oil cooler for severe duty markets, the OK1 and OK2 offers full reversibility, increases available engine horsepower, and optimizes temperature automatically making it the best cooling solution on the market and ideal for severe-duty off-highway markets such as forestry, mining, agriculture, construction, and work truck.